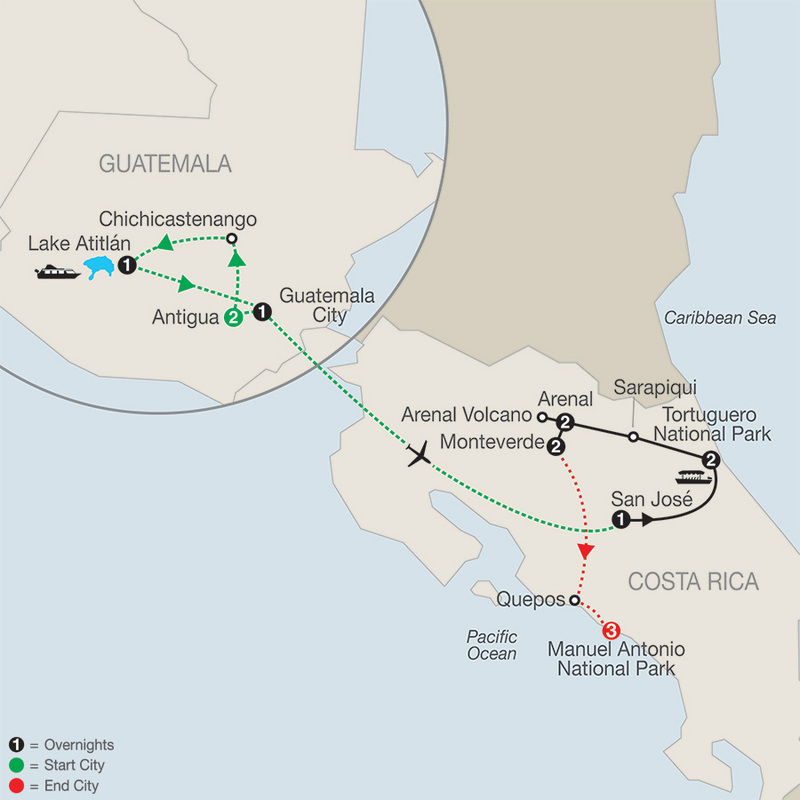 Grab your camera and get ready for a wonderful vacation to Guatemala and Costa Rica! In Antigua, Guatemala, step back in history as you explore the ruins of churches and monasteries along with restored colonial buildings. Perhaps pick up a unique Guatemalan handicraft to bring back home from the open-air Indian market. Then travel to Costa Rica and witness bountiful wildlife in their natural habitat, enjoy relaxing dips in ecothermal hot springs, and learn about the Costa Rican culture. Among the many highlights of this tour is Tortuguero National Park, where you’ll take a boat ride along remote, unspoiled sections of the park to view wildlife. Your guide will look out for the wildlife—including freshwater turtles, egrets, toucans, and monkeys—so you can sit back, relax, and take plenty of pictures. Another tour highlight is the Arenal Volcano, considered one of the most active volcanoes in the world. You may witness the red lava streaming down the sides and hear the volcano’s grumbling as you soak in the ecothermal hot springs. In Monteverde, visit the Santa Elena Cloud Forest Reserve, home to forest fauna such as jaguars, resplendent quetzal, monkeys, ocelot, and many species of birds—not to mention the large diversity of plant species. Also spend a couple of days in Manuel Antonio National Park, one of the lushest places in Costa Rica. Spend time on its white-grey sand beaches lined with tropical forest, walk the park’s trails, take a sea kayak, or enjoy a canopy tour. The park has a vast diversity of wildlife, and it’s not uncommon to see iguanas and white-faced monkeys on the beach. So be sure to grab your swimsuit and prepare yourself for the trip of a lifetime—a trip filled with wildlife, scenic waterways, tropical rainforests, spectacular beaches, and knowledgeable guides to help you learn about Guatemala and Costa Rica. Upon arrival, meet your Local Host and transfer to Antigua, Guatemala’s capital from 1543 until a devastating earthquake in 1776, when it was moved to Guatemala City. A UNESCO World Heritage Site, Antigua is one of the Americas’ oldest and most beautiful cities, with pastel-colored buildings, wide cobblestone streets, and a beautiful natural setting ringed by three volcanoes. Our morning TOUR of this magnificent highlands city, known for its 16th-century Spanish Colonial architecture, includes lively Plaza Mayor, flanked by the impressive Catedral de San José and Palace of the Capitanes Generales. We also see the ruins of churches and monasteries, some with hidden underground passages destroyed by the earthquake of 1776. You’ll also tour a local JADE FACTORY. Today, reach the whitewashed highland town of Chichicastenango to visit the colorful, open-air INDIAN MARKET and the Catholic CHURCH OF SANTO TOMÁS to witness ancient Mayan ceremonies that have long been practiced there. Continue to the shores of Lake Atitlán, surrounded by volcanoes and indigenous villages. This morning, CRUISE across Lake Atitlán. Visit the Indian village of SANTIAGO ATITLÁN and meet the Tzutuhil people, one of Guatemala’s indigenous tribes. This afternoon, head back to Guatemala City for an included dinner. 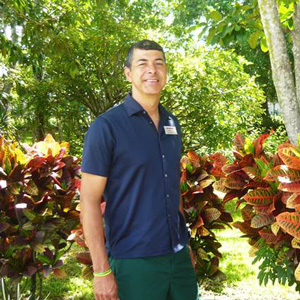 Fly to San José where you will be met by your Tour Director, who will help you check into your hotel. Journey east to the Caribbean shore and TORTUGUERO NATIONAL PARK. On the way, stop at a BANANA PLANTATION to see one of Costa Rica’s main exports being harvested. Later, board a motor launch for your CRUISE along the Tortuguero Canals, waterways crisscrossing a national park dedicated to the protection of endangered turtles. 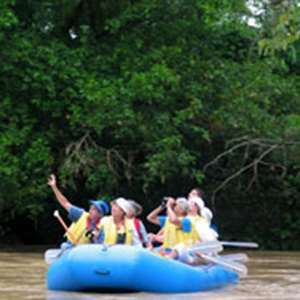 The trained eyes of your guide and boatman help you spot freshwater turtles, caimans, herons, toucans, egrets, and monkeys. An afternoon at leisure lets you explore Evergreen Lodge until you meet for an informative slideshow presentation on the area. A local Naturalist accompanies you on a leisurely BOAT RIDE along remote, unspoiled sections of the park’s waterways, explaining the bountiful flora and fauna. Enjoy a fascinating stroll through an accessible portion of the nearby RAINFOREST. During the peak nesting season (mid-July to mid-October) you may be lucky enough to observe an endangered green turtle laying her eggs under the starlight on an optional tour. Later this afternoon, meet a local Naturalist for an informative talk on the ecology of the area. A morning boat transfer begins your journey to the Sarapiqui area. Tour a PINEAPPLE FARM, owned by a local family, and learn about the history, cultivation, and industry of pineapples. Continue to your hotel in the lush town of Arenal, located in the shadow of Arenal Volcano. After settling in, experience the magic of the resort’s pool and hot spring-fed jacuzzi, or consider a walk in the nearby nature trail in search of 300- to 400-year-old trees, poisonous frogs, monkeys, birds, and possibly small animals native to the area. During your morning at leisure, you may wish to go on an optional horseback ride or float trip. Or, you can take advantage of your resort’s amenities by walking along the shaded trails nearby. Later this afternoon, visit ARENAL VOLCANO NATIONAL PARK, where your guide takes you on a walk through lava trails of the volcano and shows you how nature has found a way to recover from past lava flows. Next, enjoy a walking tour of the town of La Fortuna de San Carlos, offering spectacular views of the active Arenal Volcano. This evening, drive to nearby famous TABACÓN HOT SPRINGS for a dip in the curative and relaxing pools. Later, enjoy a dinner at the hot springs. After breakfast, continue to MONTEVERDE, where you will enjoy two days in the cloud forest. This afternoon after an included lunch, take a guided tour on the SKYWALK hanging bridges, which combines trails and suspension bridges through the canopy of Monteverde Cloud Forest, to search for flora and fauna. This morning, visit CHILDREN’S ETERNAL RAINFOREST for a guided walking tour. Over 600 species of butterflies and 400 species of birds have been recorded inside this private reserve, along with 100 reptile and 120 mammal species that hide within the dense vegetation. Later, visit the family-owned ECOLOGICAL SANCTUARY, where you will explore the trails through coffee and banana plantations filled with endemic wildlife and beautiful scenery. After the walk, enjoy a COOKING CLASS to learn how to prepare authentic Costa Rican food like hand-made tortillas, picadillos, and gallo pinto. Dine on your creations for a homemade lunch! Tonight, your Tour Director hosts a farewell dinner, toasting an unforgettable discovery of Costa Rica. Take a morning drive to the Pacific Ocean to the town of Quepos, gateway to Manuel Antonio National Park. Dense mangrove swamps sheltering a variety of wildlife back up to the pristine beaches in this area. It is not uncommon to see iguanas and white-faced monkeys on the beach. For the more active, there are jungle hikes suited to all levels. 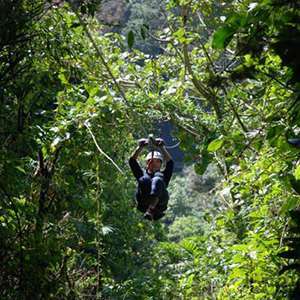 Other local activities include canopy tours, deep-sea fishing, diving, sea kayaking, and mountain biking. Enjoy two days at leisure. Your tour ends with breakfast this morning. Please do not schedule your return flights before 12:30 pm. 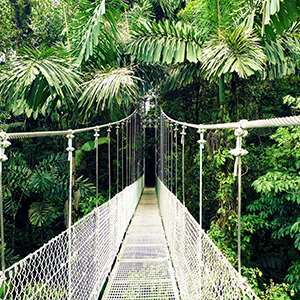 Along this guided naturalist walk, you will walk along 15 different bridges suspended in the rain forest canopy. Take in the sites from an unrivaled perspective, showing you the fascinating and colorful Tropical Rain Forest world. 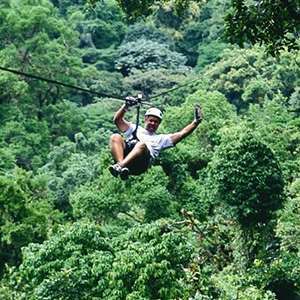 Located in a unique area between the rain forest of the Arenal Reserve and the Monteverde Cloud Forest, on this tour you will experience full adrenaline and the most spectacular views of the Arenal Volcano & Lake from the aerial Sky Tram and the Sky Trek zip lines. 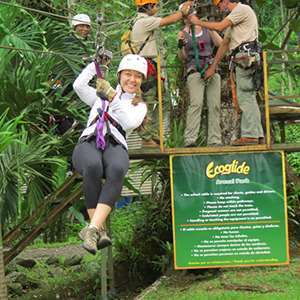 Arenal Ecoglide Park is one of Costa Rica's newest adventure parks featuring a canopy tour built to highest safety standards. The canopy tour not only offers you a great zipline adventure but also an opportunity to observe all the animal life in its natural habitat. 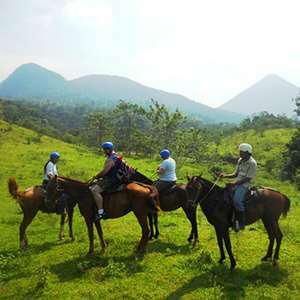 This tour begins with a horseback ride through the beautiful countryside of San Carlos Valley with stunning views of the Arenal Volcano. Next take a short walk to La Fortuna Waterfall where you can swim in the natural pool. Enjoy the sights and the sounds of the rain forest and experience its peacefulness while paddling the Penas Blancas River. 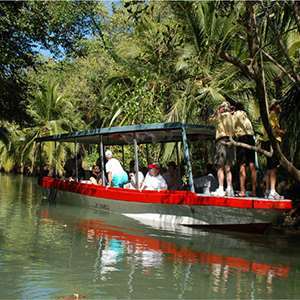 Take a guided mangrove cruise through canals in search of caimans, sloths, crocodiles, boas, white-faced monkeys, egrets, and much more. Zip along suspension cables from platform to platform enjoying the tropical forest and beautiful surroundings. 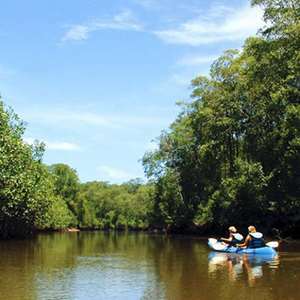 Paddle through protected inland waterways by kayak which is the perfect way to explore the coastal mangrove areas and see wildlife up close. 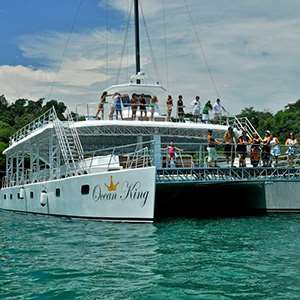 On this exciting Catamaran cruise, set sail around Manuel Antonio National Park as your guide points out notable wildlife and vegetation. You will also set anchor at Bisanz Beach where you can snorkel and savor a tasty barbecue lunch.